Esteban Gutierrez extended his GP3 Series points lead with a lights-to-flag win in the feature race at the Valencia street circuit. The ART driver's victory never looked under serious threat, and he was able to cross the line a comfortable 2.4s clear of BRDC Rising Star Robert Wickens, who had enjoyed a similarly uneventful run to second. Roberto Merhi completed the podium for the Atech CRS GP squad. The only point-scorer who saw genuine action was BRDC Full Member James Jakes, who worked his way through the field to put himself into contention for eighth, and then sealed it with a move on Tobias Hegewald a couple of laps before the end. James had a strong weekend and took pole for Sunday’s Sprint race. Jenzer Motorsport's Nico Muller won after an eventful race which saw many accidents mirroring the GP2 race. Nico beat polesitter James off the line to lead into the first corner and was never troubled thereafter, eventually winning by 3.2s. But it could have been a different story had the race been a few laps longer, as Atech's Roberto Merhi, who moved into second midway through the race, had reeled off a string of fastest laps to reduce what had been a leading margin of nearly six seconds. James, meanwhile, initially fell to third at the start when he went to the outside at turn one and allowed Rio Haryanto past, but reclaimed the spot from the Indonesian a few laps later - only to lose it again to Merhi. The weekend results mean the championship is led by Esteban Gutierrez, with Robert Wickens second on 19 points, 16 behind the leader. 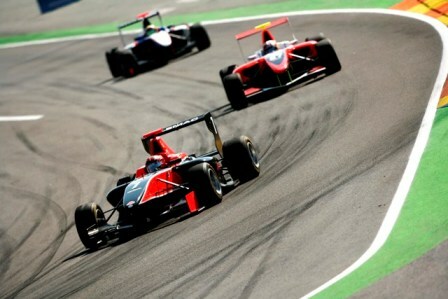 James occupies 6th place on 13 points in what is set to be an exciting series finish at Monza come September.